Metron has won a potential $12.8 million contract to develop an intelligence, surveillance and reconnaissance planning system for the U.S. Navy to counter adversarial ISR networks. The Navy will use the C-ISR system to plan coordinated friendly force movement emissions control, denial and deception operations, the Defense Department said Wednesday. The contract contains an 18-month base period, three optional task orders and one 12-month option with three optional taskings. Metron will perform work in Reston, Virginia through May 2019 if the service branch exercises all options. 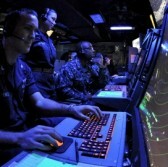 The Navy will obligate $4.8 million in fiscal 2016 research, development, test and evaluation funds at the time of award.